Bulk supports WooCommerce plugin. With the Elementor plugin you can create beautiful WooCommerce landing pages. Here is a simple tutorial how to do it. 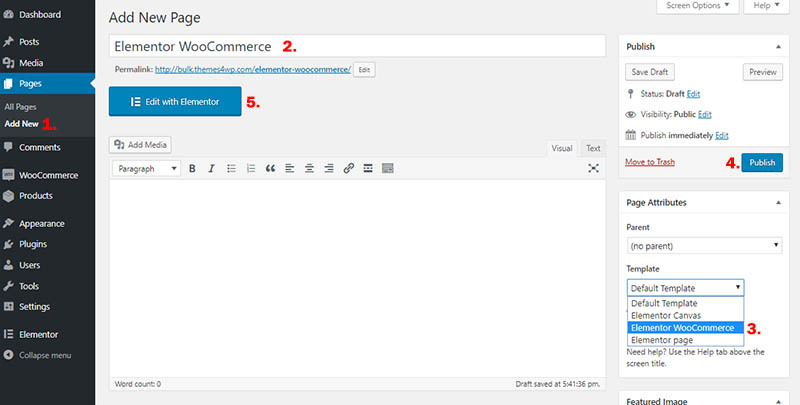 You can import 2 of our WooCommerce Elementor layouts (demos: #1, #2). To do it, download THIS ARCHIVE FILE with the Elementor Layouts. With Bulk PRO you can import 10+ WooCommerce Elementor layouts (10+ demo pages). To do it, login to your account (https://themes4wp.com/my-account/downloads/), go to “Downloads” tab and download “WooCommerce Elementor Templates” zip file with Elementor Layouts. Now the templates are imported in your website and you can use them. Note: The products and categories are not included in this import! If you need dummy products, follow this tutorial please. You can import our products from THIS file, check the video above. WooCommerce Dummy Products – Your store may look empty, right after installing WooCommerce. You can install dummy products. Missing WooCommerce Pages – If you skipped the Setup Wizard or want to re-install WooCommerce pages, go to WooCommerce > System Status > Tools and use the page installer tool. Bulk PRO is one of the most powerful, versatile multi-purpose WordPress & WooCommerce theme we have built till date. The ultimate theme you will ever need.